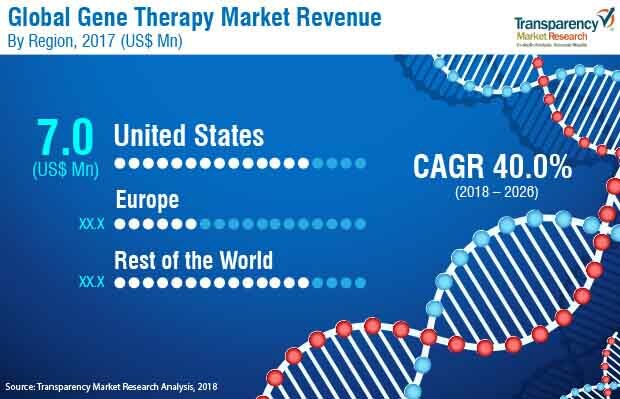 The global gene therapy market is expanding at an exponential pace due to promising therapeutic outcomes of gene therapy, high prevalence and rise in incidence of cancer, and large number of clinical research pipeline products. In terms of revenue, the market was valued at US$ 17.0 Mn in 2017. It is projected to reach a value of US$ 5164.03 Mn by 2026, expanding at a CAGR of 40.0% from 2018 to 2026. The global gene therapy market is driven by new product approvals and commercialization, increasing demand and number of gene therapy treatment centers, and large number of patient population with unmet medical needs. Gene therapy is a way of fixing genetic disorders by introducing a normal and healthy gene in place of defective genes in a cell in order to prevent or cure different types of genetic and chronic disorders for which no final cure has been developed. Gene therapy is considered as an important means of treatment, as it helps eliminate the usage of drugs, surgery, or other procedures that can have side-effects on the health of individuals. Moreover, gene therapy results in the formation of beneficial proteins that can help the body perform normal functions to its full potential. Cell-based technologies have been developing at a rapid pace, which in turn has driven the demand for gene therapy. Till date, only five gene therapy products have been approved and are currently in the infancy stage of commercialization. Gendicine was the first commercialized gene therapy product developed by the Shenzhen, China-based SiBiono GeneTech, in 2003. Gendicine was commercialized in China, in 2004. The global market for gene therapy has been expanding due to the intensive research that has offset in the domain of genetics. Demand for gene therapy across the globe has increased significantly due to the rise in awareness about the ability of gene therapy to cure diseases. Gene therapy has considerable potential to eliminate and prevent several genetic disorders and numerous life-threatening disorders, especially cancer, heart diseases, AIDS, cystic fibrosis, and age-related disorders. Gene therapy provides a complete cure to patients affected with genetic disorders, rather than ease symptoms with other therapeutic treatments. Promising therapeutic outcomes and increasing competition among leading biopharmaceutical companies to approve and commercialize gene therapy products in different areas of unmet medical needs, in order to gain the first mover advantage, are projected to boost the gene therapy market during the forecast period. Moreover, high prevalence and rise in incidence rates of different types of cancers for which complete cure has not been developed is a key factor that is expected to drive the gene therapy market. Large number of gene therapy candidates are in late stage clinical studies and are anticipated to commercialize during the forecast period. Significant investments in the field of gene-related research and development by various biopharmaceutical companies, governments, as well as research institutes offers potential opportunity to gain the first mover advantage in the gene therapy market. According to Alliance for Regenerative Medicine, in 2015, more than US$ 10 Bn has been invested by both public as well as private companies in gene therapy-related research. Companies, after initial success rates of gene therapy, are striving to increase the number of treatment centers in order to increase the access to a large number of patient pool requiring gene therapy treatments. Thus, increasing number of gene therapy treatment centers in developed countries offers significant opportunity to global players operating in the gene therapy market. The global gene therapy market has been segmented based on product, application, and region. In terms of product, there are only five gene therapy products that have been approved and commercialized globally. These include Yescarta, Kymriah, Luxturna, Strimvelis, and Gendicine. The Yescarta segment dominated the global market in 2017. It is projected to gain market share by the end of 2026. Yescarta bagged the first mover advantage in 2017 in the U.S, by launching the first CAR T therapy approved by the US FDA for the treatment of certain relapsed or refractory large B-cell lymphoma, including diffuse large B-cell lymphoma (DLBCL). Furthermore, high prevalence of DLBCL and anticipated commercialization of Yescarta in Europe and other developed countries are projected to drive the demand for Yescarta during the forecast period. The Luxturna segment is projected to expand at a significant growth rate during the forecast period. Based on application, the global gene therapy market has been divided into ophthalmology, oncology, and adenosine deaminase ?deficient severe combined immunodeficiency (ADA-SCID). The oncology segment accounted for a prominent share of the market in 2017. Of the five gene therapy products approved, three products are directed toward the treatment of certain forms of cancer. Moreover, increased application of gene therapy products in treatment of other forms of cancers is poised to drive the oncology segment during the forecast period. Based on region, the global gene therapy market has been segmented into three major regions: U.S., Europe, and Rest of World. Europe is projected to account for a dominant share of more than 40% of the global market by 2026. Increasing number of gene therapy treatment centers in the region and high prevalence and rising incidence rates of non-Hodgkin lymphoma are projected to fuel the gene therapy market in the region during the forecast period. The U.S. is projected to follow Europe, in terms of share of global gene therapy market, by the end of 2026. It is estimated that in the U.S., every year, around 7,500 patients with refractory DLBCL are eligible for CART therapy. The gene therapy market in Rest of World is projected to expand at a notable CAGR during the forecast period. In 2003, Gendicine was approved in China and was commercialized in 2004. Since then, more than 30,000 patients with head and neck cancers have been treated with Gendicine, in China. The anticipated approval and launch of gene therapy products in developed countries, such as Japan, Australia & New Zealand, and GCC is projected to drive the gene therapy market in this region. Majority of biopharmaceutical companies have made significant investments in the clinical research and development of gene therapy products. According to a report by the Alliance for Regenerative Medicine, there were around 34 gene therapy candidates in phase III clinical trials as of June 2017. Key players operating in the global market include Gilead Sciences, Inc., Novartis AG, Sibiono GeneTech Co. Ltd., Spark Therapeutics, Inc., CELGENE CORPORATION, and Orchard Therapeutics Limited.